Hoses that are used in distilleries and elsewhere in the spirits industry must guarantee both a hygienic flow and safe conduction of any static charges. 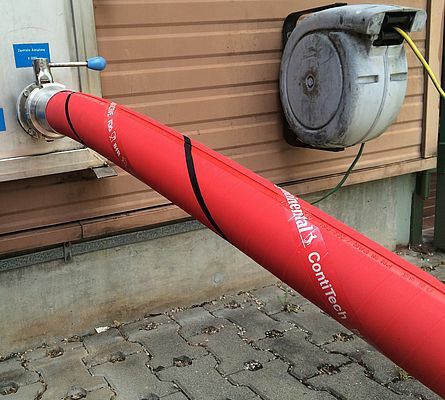 The Purple Snake Plus Conductive by ContiTech is the first beverage hose that not only meets strict food legislation requirements but also reliably conducts static charges thanks to the spiral, black conductive stripe in the white inner liner and red hose cover. The hose is manufactured in accordance with the EC regulations 1935/2004 and 2023/2006, as well as EC regulation 10/2011 on plastic materials intended to come in contact with food. Its white, homogeneous UPE inner lining conforms to recommendation III of the German Federal Institute for Risk Assessment (BfR) and was registered as a beverage hose by the American Food and Drug Administration (FDA). The high-tech hose is resistant to temperatures of up to +95°C and to common cleaning agents and disinfectants, and can easily be cleaned conventionally or via CIP. Purple Snake Plus Conductive can safely conduct any static charges. Therefore, this beverage hose is ideally suited to use in areas where potentially explosive materials are handled.